Meet Yorick. He is a college graduate with an English major, currently looking for a job. He enjoys little magic tricks and he is a new owner of a monkey that he fondly named Ampersand. He is about to propose to his girlfriend, but a world-wide genocide is about to occur leaving Yorick and Ampersand to be the only living males on Earth. In other words, a world-wide GENDERCIDE. Yorick disguises himself to survive. He discovers that some women are happy that the men are gone, and some are willing to do anything to keep it that way. His mother, a US Senator, is thrown into the politics of trying to keep the country alive and the democracy together. On the other hand, his sister Hero, finds herself in a new world that she does not understand and an essential part of an extremist group. He also meets Agent 355 and Dr. Mann, two women that are hoping to find some answers to the deaths and to find a solution for the country. As these latter two travel across the country with the remaining males, they face a multitude of difficulties, from surviving Yorick’s sorry attempts at literary wit to staying alive. Yorick continues his journey across the country with Agent 355 and Dr. Mann, facing more difficulties along the way, including a face-off with his very own sister. Obstacles are found around every corner, the party becomes a target for many groups, but there may also be hope for "man"kind. 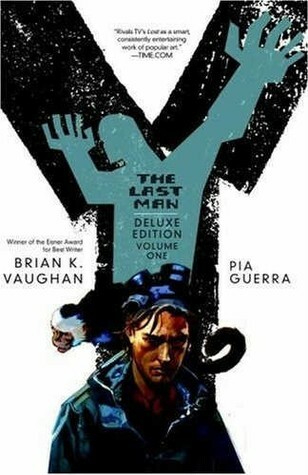 Y: The Last Man is a graphic novel that was originally recommended to me by a friend. It was a series that I had never heard of before, but immediately fell into the story. 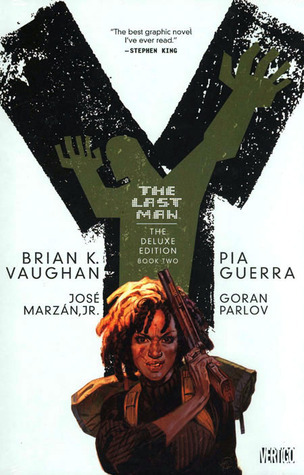 Vaughn brings us characters that appall us, annoy us, and leave us wondering. However, he also keeps me turning the pages at his profound idea of a “gendercide” and just how important both men and women are to our society today in so many different ways. Yorick himself is a bit overconfident, getting himself into trouble more often then his comrades would like, but he is also witty and honest. He has me giggling throughout the books, yet thankful that this is the man that survived. I look forward to reading the rest of the series in the near future. The ending of the second book leaves the reader filled with both anxiety and hope, and I simply cannot wait to find out what happens next. Have you experienced Vaughn’s gendercide yet? What do you think about Yorick, his monkey, and his tale?